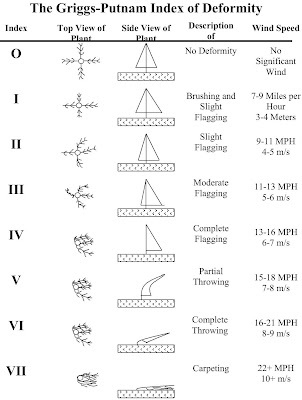 I was doing some research for work on wind farms, and I found that the average wind speed at a particular location can be estimated by the shape of the trees that grow there. That made me think of these pictures of Monterey Cypress trees I took in Pebble Beach, California on the beautiful 17-Mile Drive. The photo above is the famous "Lone Cypress", which the Pebble Beach Corporation claims to have copyrighted. If you are reading this, my blog has not yet been shut down by their overzealous lawyers. 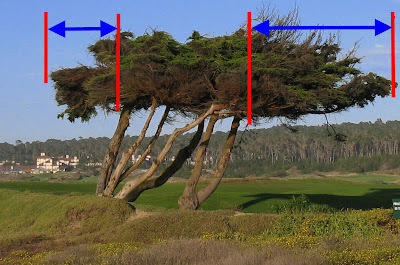 The photo below was taken from an angle that really shows the shaping of the trees. You can see that the amount of leaves and branches to the left of the left-most trunk is much less than the amount to the right of the right-most trunk. This is called "flagging", since the tree is starting to look like a flag, with the fabric (the leaves and branches) all to one side of the flagpole (the trunk). 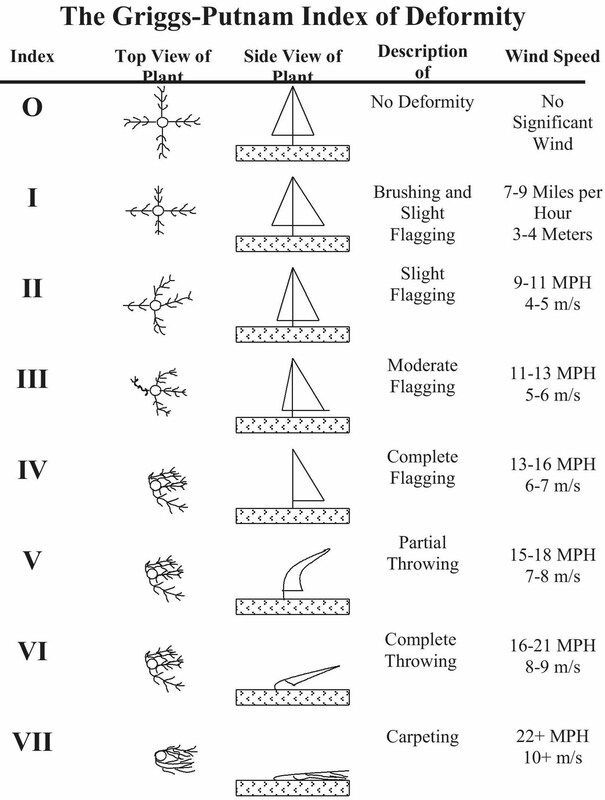 A couple of guys actually sat down and put together a scale to gauge wind speed based on the flagging of trees. When a tree starts bending over from the wind, they call it "throwing", and when it gives up and lies down they call that "carpeting". I love their descriptive language! This table is courtesy of Idaho National Laboratory. 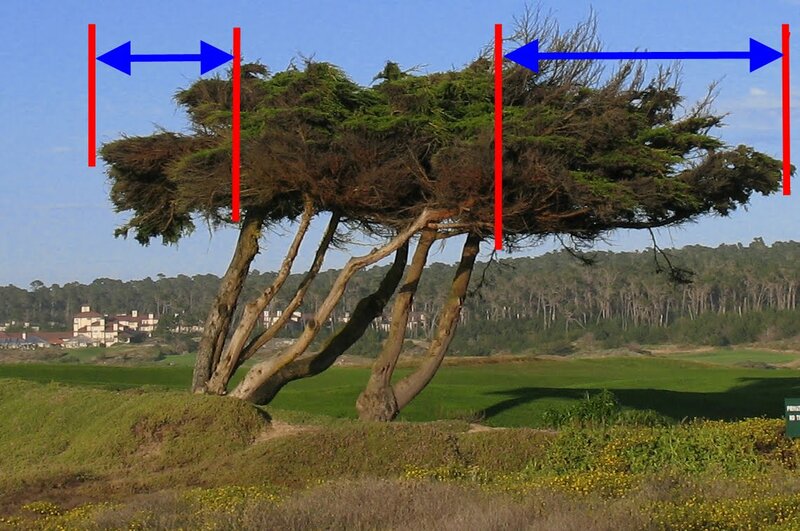 When I did some more reading about Monterey Cypress trees, I found that only some of their deformity is due to the wind coming off the ocean. Some of it is due to "salt pruning", which is damage to leaves due to the salty mist. So these trees are getting a double whammy, a wind that is carrying salt mist. One more thing about the famous Lone Cypress. 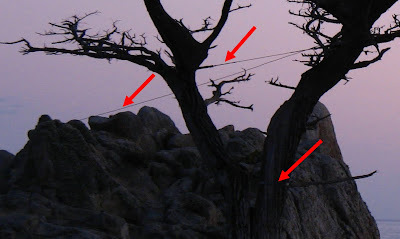 If you look a little closer, you will find that the Pebble Beach Corporation has protected its money-making copyrighted tree by tying it to the rock outcropping with wire. The Pebble Beach Cypress tree has been replaced by the Pebble Beach Company many times. Annoyed by the tourist traffic, he Carmel High class of 1972 burned one of them down with gasoline. Wow, I had no idea. I would say that is funny, but of course it is also dangerous and mean to an innocent life form. Has the Pebble Beach Corp also copyrighted the sunset? Following a Lafayette may display the final battle on line casino, chanel replica as well as move technique this year, as well as the 2016 springtime as well as summer time ladies display invite was created having a boarding move, the actual picture from the day time sitting visitors should await the actual chanel replica panel doorway open up. The actual display had been actively playing which day time triggered the actual enrollment airport terminal, the actual versions possess stunning incarnation good looking pilots as well as trip family and friends. The actual season's clothing utilizing a azure, red-colored, whitened mainly colour, as well as much less iconic wallet design as well as style. Rock and roll leather-based coat, sports activities limit, perform the actual aged cowboy, steel sequins design along with other ornamental Youthful additionally made an appearance with this display ground. Mind associated with Chanel's London condo thought to be numerous individuals desire houses, the actual query is actually exactly how passed down chanel replica sculpt, but additionally produce their very own cool part from it? The actual 2014 fall as well as winter season high-set display made to the actual twentieth hundred years design London condo, filled with builder design, however Versailles environment. table 49 mm Replica Rolex Watches in diameter, when, in two, five seconds, a small Dubois Depraz asked time, hand chain five two Q movement, Designer handbags sapphire crystal mirror, bottom Gai, germanium and silver alloy material ArgentiumR handbag replica patent “Barleycoron” of Wheat twist a rope groove after the lifting of Gai, waterproof 30 meters, with Sterling Silver bracelet.In the pocket UK Replica watches era, both durable and low cost of the silver case can be said to Watches Replica .